It's here - my simple Transition Kit. Already certified (or close to it)? Confused about the changes and all the 'You must get this training!!" flooding the marketplace? 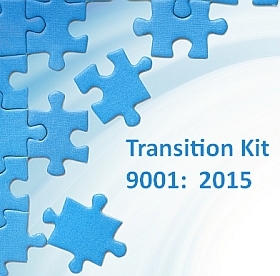 Don't worry: my DIY 2015* Transition Kit makes it simple and practical, as always. Transition Guideline - the major changes, what they mean. The 11 tasks you simply must do - and the 6 you shouldn't. Gap Analysis for ISO 9001: 2015 - self evaluation checklist. Also sold separately. Checklist of Written Information required in ISO 9001: 2015. Get it now and start our transition immediately to the 2015 version. *Note: The Australian issue of ISO 9001: 2015 was not published until 5 months later than the official ISO one, in March 2015. Because of this, the Australian publication has the title of ISO/AS/NZ 9001: 2016. Ignore that - it is exactly the same Standard.